Tala Salem is a student at Northwestern University, double-majoring in journalism and economics. 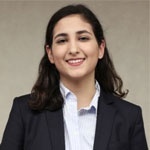 She's originally from Amman, Jordan and currently interning at Wamda Capital in Dubai. She can be reached through talasalem2019[at]u[dot]northwestern[dot]edu.